We carry a huge selection of chair mats. Our chair mats offer durability, protection, appearance, at a good value. With our commercial quality heavy duty chairmats you get it all!! 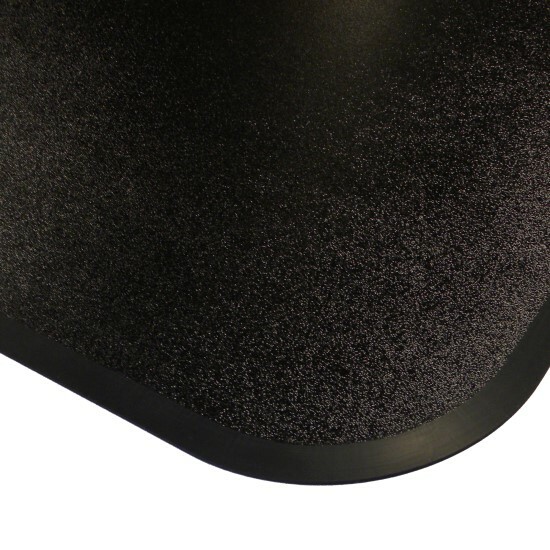 All chair mats have scuff resistant surfaces that allow effortless mobility of your office chair - reducing back strain. In addition, our vinyl and co-polyester chair mats are exceptionally clear, enhancing the natural beauty of your carpet or wood floors. A chair mat can save your back, your carpet, and your hard floors. We only will sell top quality chair mats manufactured here in the USA. We offer the Heaviest Duty Chair Mats! Available in sizes not found anywhere! Available in Commercial Grade vinyls, Heavy Duty Laminates, and Rigid Co-polymers. 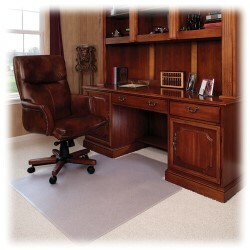 Heavy Duty Chair Mats for Carpet. Looking for the heaviest duty chair mats available for carperting? We have them! 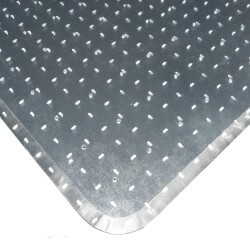 Non-Studded protection for any hard surface floor including hardwood, vinyl, tile, marble and terrazo. Offered in Clear Vinyl's, Clear Co-polyester, Black Vinyl and Black Rigid Polymer. Use where dampness and mold are potential issues. Each Mat has a vented ports spaced every 2.5 inches to allow your carpets and floors to breathe. Just like you are sitting on a hard surface floor! These mats are rigid and help you to roll freely. Even when used on Plush Carpeting! Available in many patterns in wood grain laminates and solid black thermoplastic. These items cannot be rolled for shipment and ship flat. Oversize shipping rates may apply. Carpeting or Hard floor applications. Two material styles to choose from. Protects flooring from caster wear, spills and heavy traffic; also covers worn, damaged or stained flooring. 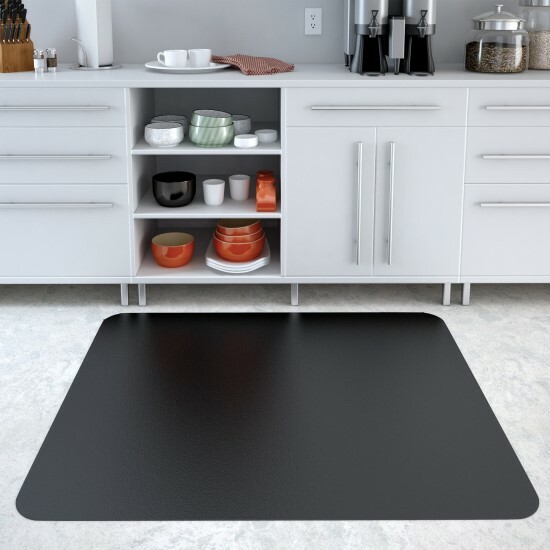 Ã¢â‚¬Â¢ Traction backing keeps mat in place on ANY surface (any pile carpet or hard floor) and protects it from chair movement. 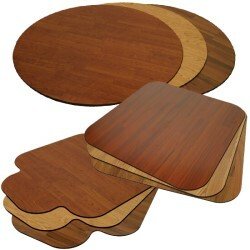 Ã¢â‚¬Â¢ 3/8" thickness ensures this wood chair mat won't crack, dimple, or break. Ã¢â‚¬Â¢ Green Product - the wood fibers come from sources certified by the Sustainable Forestry Initiative (SFI) and have been awarded Greenguard Certification. The total recycled content by weight is 65%. NOTE: This chair mat is not recommended for use with hard-ball casters or metal wheels. Very Easy to do with our APP. The following link will assist you in either customizing your mat from some of the most popular style patterns or you can actually draw your own using our proprietary drawing tool. Included are very detailed help instructions so you will be able to actually design your mat accurately. Make your overall size and pattern/custom drawing selections. Ideal for hallways, entryways, copy machine stations and other areas with repetitive foot traffic. 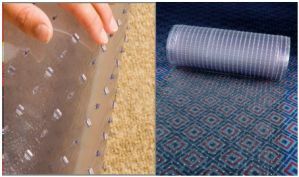 Our Clear vinyl runners help extend the life of the carpet while allowing the color and design to show through. 36 inch widths up to 50 ft lengths. 48 inch widths up to 50 ft lengths. Protect your investment. Soft Wheel chair casters greatly extend the life of any chair mat from any manufacturer.